I know what you're thinking: the XPro-2 just got announced. Reviews and first looks are still coming in, we haven't even had the chance to hold the physical product in our hands yet and I'm already talking about a camera that hasn't even been hinted at. You'll have to forgive me for peeking behind the curtain a bit while everyone else looks over the main attraction. I just can't help but feel like we've been given some insight into Fuji's next X-T camera, and I'm already excited to see what could be just around the bend in a future X-T2. When it comes to engineering a new camera, there is a design and development stage that has to take place that can take many months if not years to get just right. In fact, Billy from The Fuji Guys shows us a great behind-the-scenes video where we not only see the three prototype phases that the X-Pro2 went through before the final design was finished (4:10 into the video), but also all how all of the internal components have to be designed and fitted into those new designs (3:00 into the video). Fuji has taken the time to develop a great new sensor, processor and many ergonomic and software enhancements that make the X-Pro2 a fantastic addition to the X-Series. After a lot of hard work, all of that time spent on design and development finally transitions over to manufacturing and shipping. Vacations may or may not happen, but at some point a very tired yet experienced design team is going to focus on the next camera in line for an upgrade: the X-T1. But when it comes to the X-T2, Fuji is not going to reinvent the wheel. Money and time spent on design and development for the X-Pro2 are almost certainly going to influence the specifications of the future X-T2. It only makes sense that the older design (X Trans II, 16MP) gets fitted into their newer compact cameras like the X70 while they focus the newer sensor and processor technologies (X Trans III, 24MP, X Processor Pro) on their more professionally-oriented cameras. The X-Pro2 has, by simply being introduced, probably shed a spotlight on what we can expect in the X-T2. Let's take a brief look at what X-Pro2 technology is most likely to make its way onto the X-T2. Technology is in bold with my comments (if any) next to them. Again, you can chalk this up to pure speculation, but it's also a bit of common sense. These are great enhancements, and this work seems like they can be repurposed (and possibly expanded on) in their future cameras. 24.3MP X-Trans III Sensor - I'm looking forward to the added resolution, especially for prints. X Processor Pro - Four times as fast as the current processor. 1/8000s mechanical Focal Plane shutter - They say it sounds great on the X-Pro2! Lossless Compressed or Uncompressed RAW Settings - Early reviews are showing little difference in quality, so I'd probably opt to save the hard drive space and go lossless. Joystick control for AF points - Officially referred to as the "Focus Lever". See a mockup of this below. Increased phase detection area and AF points - X-Pro2 is up to 273 points, can they get more into the X-T2? Acros Film simulation - It's possible that this film simulation will be supplied to the X-T1 in a future firmware update, but it's also possible that they hold it back to make it an exclusive X-T2 feature. The X100S never got Classic Chrome, for example. You need to upgrade to the X100T to access that simulation. Grain Simulation - This is a similar situation as above. If it's not offered in a future firmware, then it's most likely destined to be an exclusive X-T2 / X-Pro2 feature. Center weighted metering addition - This isn't included in the mockup below but it would most likely be included on the same metering dial as the X-T1. Dual SD Cards - And I'm sure they'll make the door latch itself sturdier and more solid, as well. This appears to not be an issue on the X-Pro2. Touch Screen - And while we're on the subject of the X70, perhaps the X-T2's tilt screen would be touch sensitive as well. Again, maybe it's not something you'd use, but it might be handy on a camera equipped with a tilt screen like the X70 and X-T2. After all, we know they have the technical ability to do it. A Next-Gen EVF - The updated EVF on the X-Pro2 is 85 fps. The current X-T1 EVF is 54fps so it's likely that it'll at least match the 85 fps in the X-Pro2. But can Fuji take it up a notch from there? 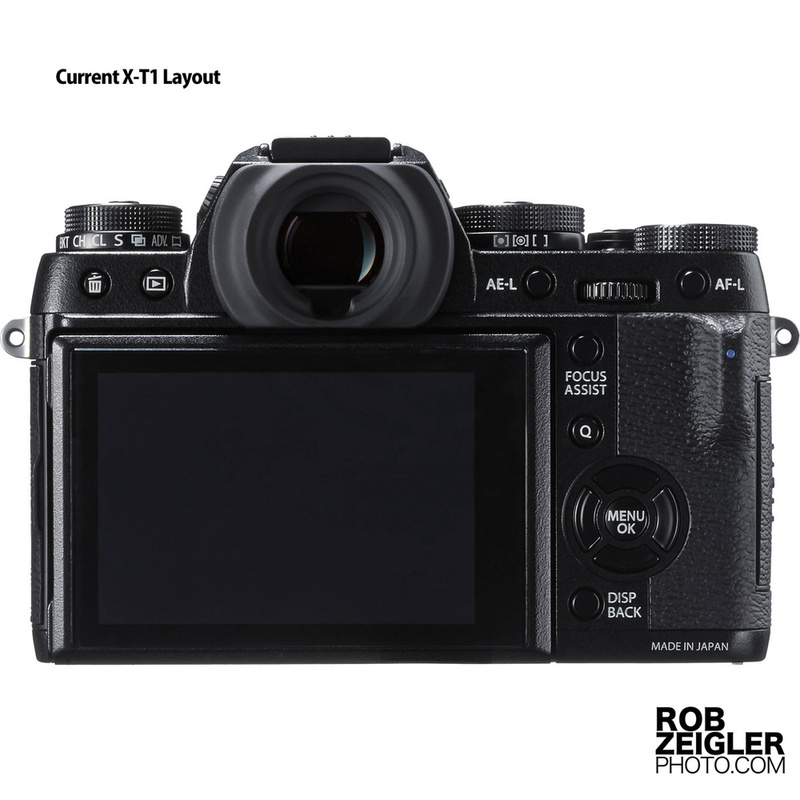 The X-T1 introduced a great dual screen manual focus mode which many found revolutionary at the time. Can Fuji take advantage of a large, bright EVF to squeeze in new features that are just as exclusive to the X-T2? Enhanced Autofocus Systems - Given enough research time, it's possible that the new X-T2, coupled with the new processor, can be further refined to produce an even faster, more mature AF system. A New Film Simulation - Superia, perhaps? Grip Ergonomics - The grips were redesigned for both the X-Pro2 and the X-E1s, so it's only fitting that Fuji update the X-T2 as well. I use the additional hand grip accessory as of right now and I find it to be much better than the stock X-T1 grip. Slightly different button placement on back to compensate for Focus Lever - The Focus Assist and Q buttons will be repositioned to allow for the Focus Lever to be to the left of the thumb grip on the back of the current X-T1. See the images below for a mockup. D-Pad Button Responsiveness and Locking Feature on the ISO Dial - Fuji may address these commonly noted design quirks with a creative solution. I'll go on record with saying I'm fine with both of these features currently, though I've seen some reviews go off on them. Above: An image of the current X-T1 next to a mockup of how the X-T2 may integrate the Focus Lever found on the X-T2. Fujifilm will no doubt alter other elements of the design to accommodate other unannounced features and design choices. Click the images above for larger versions and to scroll between them. So there you have it. Again, a lot of time and money was spent on these new components and as the X-Pro2 project wrapped up I'm sure they transitioned personnel onto an X-T1 successor. There's a lot of heavy lifting that's been done with the new design of the X-Pro2, and it makes perfect sense that they'd do whatever they can to quickly and inexpensively transition all of that hard work over to enhancing their DSLR-style line as well. Some may ask, "What about an X-T1S?" To that I say: we're most likely already using the X-T1S. After numerous firmware updates with new software, film simulations and an incredible new autofocus system, we're already using that kind of incremental update. If Fuji is to add in a new sensor, processor and a redesigned body - that's an X-T2. Fuji has really done an amazing job with the X-Pro2. I really like what I'm hearing about it and it sounds like a camera I'd love to try out. In fact, I'll probably rent it just to give it a go and experience the new sensor and shooting experience for myself. But when it comes time to make a purchase, I'll wait until they include all of the same features, and possibly some new surprises, when they release it all as the X-T2.